This corded necklace is made using satinique cording for a beautiful shine. It measures almost 20 inches with a center jeweled piece that adds 2 inches. It is done in a white and royal blue with silver findings. 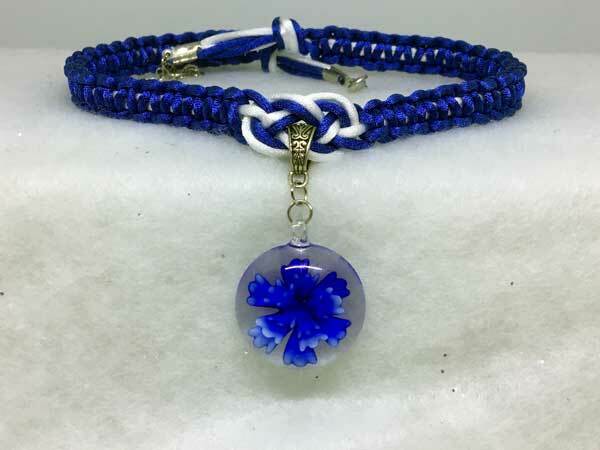 The jeweled piece is a Lampwork glass round containing a floral design. The floral is vivid royal blue that fades to lighter shades of blue and then to white on the ends. The piece is finished with a lobster claw clasp and added chain for more versatility with the length.